Asian American feminism, politics, and pop culture! 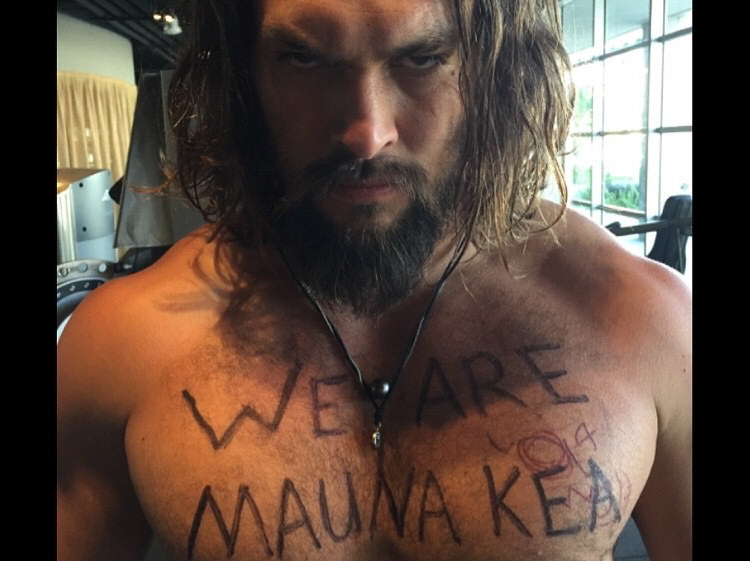 Jason Momoa, supporting Mauna Kea. For the last week, hundreds of Native Hawaiians have taken to the streets to protect Mauna Kea, the highest peak on Hawaii’s Big Island. Two years ago, the Thirty Meter Telescope (TMT) Project was awarded a permit with the collaboration of the University of Hawaii to build a telescope with a 30 meter aperture on the summit of Mauna Kea. The planned Thirty Meter Telescope is an internationally funded $1.4 billion piece of equipment that upon completion is expected to be able to see up to 13 billion lightyears away with unprecedented resolution at multiple wavelengths. This is a worthy cause that I can appreciate as a scientist, but not at the expense of Native Hawaiian people, who revere Mauna Kea’s summit as both a holy place and a burial ground for elders. Native Hawaiians have protested the TMT Project since plans to build it on Mauna Kea were first announced. Last October, dozens of protesters disrupted the TMT Project’s live-streamed groundbreaking ceremony with a peaceful, non-violent demonstration. Mauna Kea’s protecters are concerned that Native Hawaiians were not adequately consulted prior to the state Board of Land and Natural Resource’s decision to allow construction on Mauna Kea’s holy ground, and that the entire area is also environmentally fragile. The protesters are hoping to take their challenge of the TMT Project all the way to the Supreme Court. Become a monthly contributor to Reappropriate and get exclusive access to patron-only content! Alternatively, subscribe to Reappropriate through Paypal.